I’m sure that I’m not the only oke that still has dreams of flying a fighter jet. I blame it all on a certain movie in which our most favourite scientologist acted. And if you don’t know what I’m talking about, then you’ve either been born under a rockâ€¦ or I’m showing my age. Where was I? Fighter jetâ€¦ yes. So with me being a big wanna-be fighter pilot I was looking forward popping this game in the machine, crank up the volume and fly at Mach 2. I need to point out that H.A.W.X. (High-Altitude Warfare Experimental Squadron) is not a flight simulator. It’s a flight something but not a simulator. 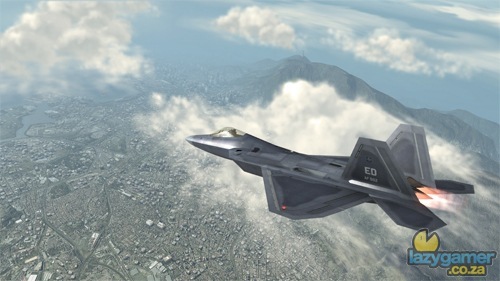 There are no fuel gauges (which is a good thing, we watch our own fuel usage enough already) and even though the planes are modelled after real world fighter planes, no fighter plane I know of can carry 200 multi-purpose missiles. Ubisoft Romania quite obviously didn’t go for the realism factor while developing this game and I can assure everyone that it was the correct choice. 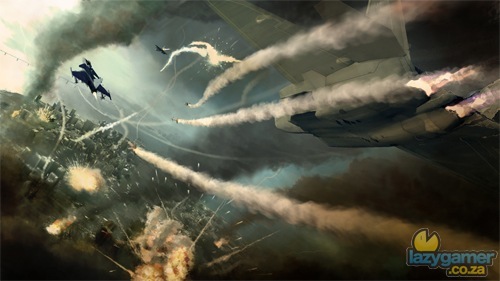 As can be expected in a game with the name â€œTom Clancyâ€ in the front, the world is once again in some major conflict and it’s up to you and your squadron to save the day. You play as Captain Crenshaw, a flyboy who formerly flew for the United States. With your squad being dissolved, you are now looking for a new job to make ends meat. In steps a Private Military Corporation called Artemis. As usual I do not want to go into to much details of the story, it’s just too easy to work an accidental spoiler into the review. 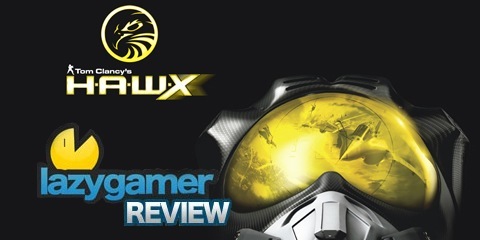 I do need to point out that even though Tom Clancy probably didn’t write the story for H.A.W.X., I was quite pleasantly surprisedâ€¦ it’s not half bad. In no stretch of the imagination will it win a Pulitzer, but hiding away a twist here an there will keep you interested long enough to finish the game. There are a total of 19 missions to fly through, coming in at 30 minutes to an hour for a campaign, you can see that there’s quite a bit of play time. What makes this even more exciting is the co-op mode. 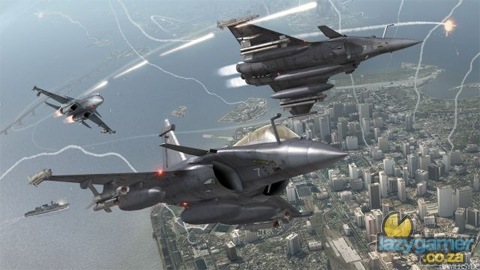 Any and all missions can be played online with a friend as your wingman, which totally changes the dynamic of the game as the AI wingmen are nothing to brag about. The control you have over your AI wingmen isÂ very limited, all you can really do is tell them to either cover you or to attack. So having a real person back you up (or you him) helps quite a bit in the hectic air battles. There is also a versus mode and I would have loved to tell you more about it, but unfortunately while I had the game there was no local gamers to play against. What I can tell you though is that the versus mode allows 8 players to join a deathmatch. This was apparently limited to only 8 to combat lag issues. The versus is a straight forward everyone-for-himself air-brawl. The developers added some additional weaponry that can be unlocked via kill streaks. So from time to time, you will be able to throw an EMP (among other things) to disable opponents. The game also has a bit of a RPG element to itâ€¦ although in games of today most have. For everything you do, be it single player, co-op or versus you get XP. The XP is then used to level up your pilot, and as your pilot’s levels increase, you unlock more planes and more weapon loadouts. If there’s one thing that H.A.W.X. (try typing that a few times) does not lack, it’s planes and weapons (ok, you caught meâ€¦ that’s two). Before each mission you can choose what plane and loadout you want to use. The game also has a recommendation for each mission, but don’t let this stop you from selecting you favourite plane time and again (F14 Tomcat for me, if anyone was interested). H.A.W.X. (again) also offers an extensive slate of challenges (outside of you Gamerpoint achievements), which adds huge chunks of XP after each mission. These challenges range from how many kills you racked up with a specific cannon or missile to the amount of kills you got in a multiplayer match. You can see how far you are from attaining a challenge by checking your pilot stats. The first few mission feels kind of sluggish but it luckily picks up after about your 4th campaign. Initially you only have your normal view points (cockpit, behind the plane etc), so to get another plane in you sights is a matter of flying in circles or using your ERS (Enhanced Reality System) gates. This is gates shown in front of you plane that you fly through to get behind the targeted bogey. This kind of flight feels a bit slow but as soon as you get the ability to switch of your ERS (called Assistance off) it’s a totally different ball game. Double tapping any of the trigger buttons, pans the camera away from the plane to a static floating point. This then allows you to have a lot more funâ€¦ the dogfighting becomes a real sport. Instead of flying endless circles, the â€œAssistance Offâ€ (AO from now on) mode allows you to do some freakishly acrobatic aerial combat. This turns every engagement into cat and mouse chases. The AO allows you to slow down and turn on a dimeâ€¦ this helps quite a bit to shake of any missiles coming your way. The trade of for this new ability is that if you slow down too much you plane will stall and start plummeting to the ground unless you level up horizontally and punch the throttleâ€¦ stalling close to the ground usually means *splat*. The planes are spectacularly modelled, every little detail has been added to the outside as well as the inside of the plane. The explosions of flak and missiles are very well done and the static blur across your screen when being hit is a great touch. The cities looks wonderful from a few thousand feet in the air but on closer inspection the textures are horridâ€¦ it actually looks like a pixelated Google Earth satellite photoâ€¦ Or a $100 million GeoEye satelite imagery render?. The sound on the other hand is truly great, the sounds of explosions and bullets flying by is really good. If you you want to have a real flight simulator, rather invest in MS Flight Sim and give this game a skip. If however you want to have some flyboy fun (and that’s what games are all about) then go get this. Stay tuned for a possible small multiplayer review at a later stage. Works great as a arcade flight simulator. The planes are excellently modelled but the lack of detail when getting close to the ground keeps this section out of the high 8’s. The sound is top notch, with flak cannon explosions, AA bullets whoosing byâ€¦ it feels as if these things are happening right next to you. This is not a realistic flight simulator, it’s more of an arcade flight simulator. In my opinion this allows for a lot more fun as reality doesn’t get in the way.